Quick and easy Greek lemon chicken with potatoes is the best recipe for a quick after work dinner or to spoil your guests. 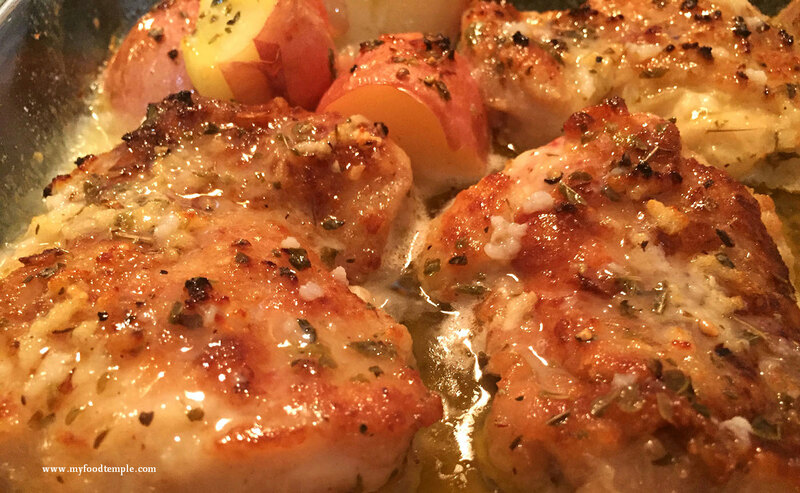 This Greek chicken recipe uses boneless chicken thigh fillets with skin on. The chicken is oven roasted in lemon garlic sauce with potatoes and the tangy lemon garlic sauce is amazing. It is my favorite chicken recipe ever. The chicken is actually cooked in lemon and garlic and comes out very tender and bursting with flavor. Spoon generous lashings of sauce over it before serving. The sauce goes beautifully with chicken and potatoes. Serve with a side of broccoli and spoon the sauce over that too. I’ve made it with the bone in and boneless – and the flavor was great both ways, although I preferred boneless. Boneless thigh fillets with skin on work great for busy people because they are quicker to cook and more enjoyable to eat without the bone. The skin also protects and keeps the top of the chicken super tender and crisps up – delicious! Just buy chicken thigh fillets with skin on and just ask the chicken shop or butcher to remove the bones from them. I do this all the time at no extra charge, no problem. Your pets may be annoyed if you don’t bring the bones home though.. Of course you can remove the bone yourself if you prefer, it just takes time, and seriously, who has oodles of that to spare? As the thighs have no bones, just boil or microwave the potatoes in their skin until soft. then cut them into quarters ready to place in the dish with the chicken, or simply crush them a little on the serving plate and spoon over the lemon garlic sauce after the chicken has cooked in it. This makes the potatoes taste tangy, very soft and surprisingly creamy. The skin on the thigh fillets gets properly browned in the pan before going in the oven – this makes the whole cooking process quicker and ensures the skin is brown and crispy while the underlying chicken is tender and moist. The flouring process helps protect the delicate white chicken meat to help stay very juicy. I have put 2 recipes below. They are the same except that one serves 2-3 (2 large servings or 3 standard servings), and one serves 4 people (standard servings). Pour cooking juices (sauce) over chicken and potatoes to serve - be generous! So below is the same recipe, but it has been adjusted to make 2 servings (large) or 3 servings (standard). If you are a couple, and simply want standard servings, then one of you can have the third serving for lunch or dinner the next day. If you don’t want that, then just throw in 4 chicken thighs and 2 potatoes and leave everything else unchanged – easy. This is one of my personal favorite dishes. I hope you love it as much as I do! Tell me what you love about the pairing of lemon, garlic and chicken or chicken thigh fillets in general, in the comment section below.